This activity can be completed individually or in small groups. 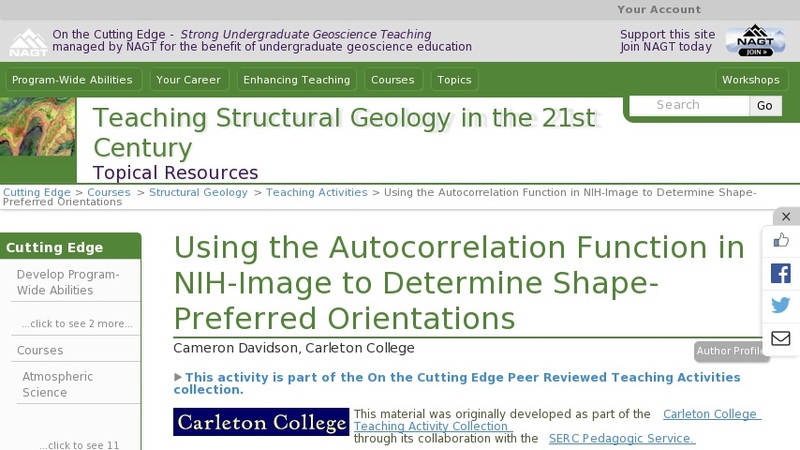 The first part of the activity focuses on exploration and discovery of how autocorrelation function (ACF) images correspond to real images. The students are given six synthetic images with particles of known aspect ratio and shape preferred orientation. They follow a detailed recipe for generating ACF's, construct a figure comparing images and ACF's, and are asked to write a short narrative describing the qualitative relationship between an image and ACF shape. The students then learn how to measure the ellipticity of ACF contours and plot these data to discover the relationship between shape preferred orientation and ACF ellipticity. After completing the discovery part of the activity, the students apply this knowledge to images of thin sections from the Quottoon pluton near Prince Rupert, British Columbia. In addition, they learn how to measure ACF grain size and plot these data and ACF ellipticity as a function of distance from the Coast shear zone, a major oblique-slip shear zone that defines the western border of the Quottoon pluton. Finally, the students are asked to discuss the relationship between shape preferred orientation, ACF grain size, and the Coast shear zone.